If you’ve ever driven down Missouri’s highway system through the Ozarks in the last 50 years, chances are you either drove the interstate or you drove down Route 66. You probably remember driving past a number of businesses regardless of when or which road you took. The Mule Trading Post has been a long standing business over the decades. Countless amounts of grape stands have been part of the roadside scenery. You may even remember businesses peddling Ozark baskets or walnut bowls. 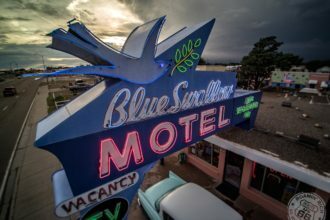 Business is what makes Route 66 so alluring. As a child, my family went on many road trips to the Branson area starting when I was just 4 years old, in the early 1980’s. Looking through the window of our family car, I became fascinated with the creative establishments many of the roadside entrepreneurs fashioned. To a child, these were inviting landmarks that indicated to me how far along we were on our typical road trip. Seldom was I lucky enough to visit some of these places along the road when my Mother would ask to stop for some quick shopping or if Dad just needed a break from driving. Most of the time I just had to rely on my imagination to wonder what kind of neat stuff was in all of those businesses. Johns Modern Cabins always caught my attention and piqued my interest. 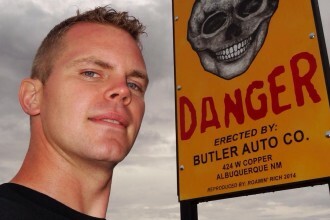 My recent involvements in Route 66 have led me to ponder about the evolution of businesses on Route 66. Why do some places thrive for decades while others struggle to make it for months??? 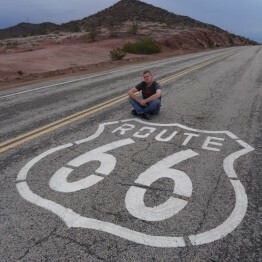 In my opinion it all comes down to the people that are passionately committed to surviving as a Route 66 business. 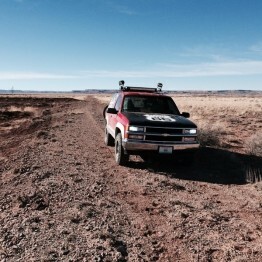 There’s probably nobody else more qualified in Missouri to be experts on Route 66 Survival than Tim and Alice Jones. 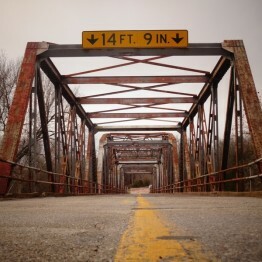 Have you ever driven down I-44 or Route 66 headed west out of Rolla, MO? Either way you couldn’t miss the Jones’ business. Certainly the colossal advertising of Totem Pole Trading Post standing tall above everything else over the Ozark horizon would have beaconed for your attention. 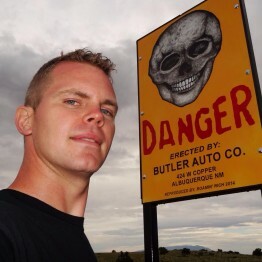 You know the place and the Totem Pole Trading Post is where you can find Tim Jones on most any day. 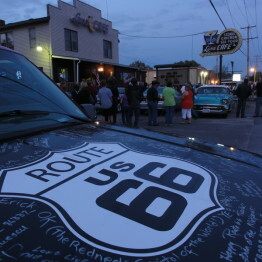 The Jones’ establishment is credited of being one of the oldest Route 66 businesses staying in operation on Missouri’s section of the Mother Road. Starting in 1933 Harry Cochrane opened up the first Totem Pole Trading Post on Arlington Hill just 10 miles to the west of the existing location. 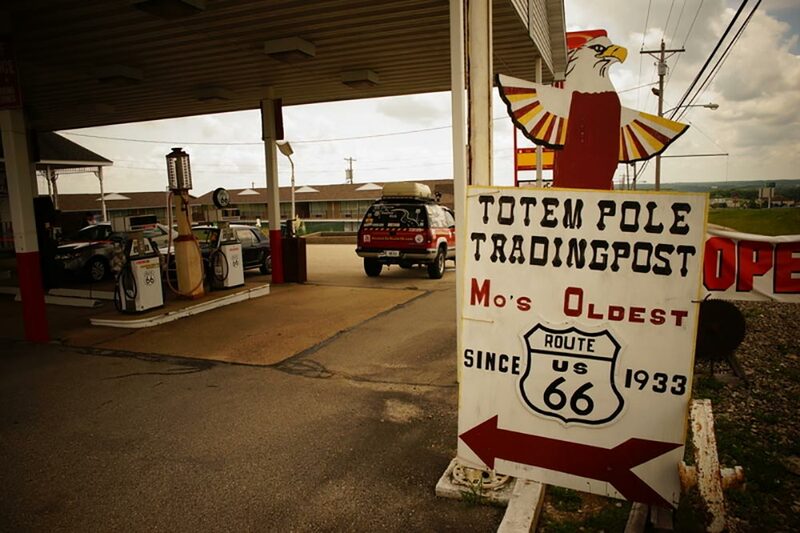 They erected a small building with a Totem pole on top and they sold souvenirs and gifts to Route 66 travelers. In addition to the souvenir stand they also had a tourist camp. Ralph Jones, Tim’s father purchased the trading post from Harry around 1950. Keeping your business alive on Route 66 has always been about carving out a unique identity for your store, making sure you have quality goods at fair prices, making sure competition doesn’t beat you out… But many people didn’t expect to consider progress as a formidable hurdle on the road to economic success. As our needs evolved so did our infrastructure. After World War Two there was no denying that our highways needed be made larger and more efficient. Expansion of the highway system managed to wipe out many businesses, especially in Missouri. The Stoneydell Resort was one of those casualties that we all wish we could patronize today. The Totem Pole wasn’t exempt from national progress. Around 1954 the state bought some the property where the campground was located. The cabins had to be moved to make way for an extra set of lanes to be brought through. In 1967 the Highway Department came knocking again. This time they were taking the property where the store was at in order to make service roads for the new interstate. This shut Ralph and Tim down for the moment. One of the original buildings still stands in the Arlington Hill area. 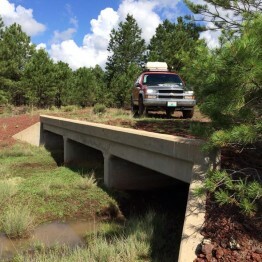 According to Tim Jones the Missouri Highway Department saved it and used it as a planning office while constructing a new highway through the area. It’s a little red building resembling a small cabin. It sets just west, across from Johns Modern Cabins off Arlington Outer Road. The little building was part of the Totem Pole Tourist Court. The original totem pole that stood atop of the souvenir shop is now located inside of today’s Totem Pole Trading Post. Ralph’s father more determined than ever moved the store to its second location. They were now operating in a new building even closer to Rolla. As luck would have it old Route 66 was located behind their building and the new Super 66, 4 lane highway was out in front complete with driveways connecting their business to a plethora of travelers driving between Chicago and Los Angeles. The second location was at what is now 15990 County Road 8140 in Rolla MO. The building still remains and is now used as an auction house. Tim and his wife Alice took over complete ownership in 1974. Yet again, progress determined the fate of the Totem Pole. In 1977 Tim was forced to close this second location as well because four lane 66 was being changed to an interstate which meant businesses could no longer be provided direct access from the highway. The state removed their driveways and yet again disrupted their livelihood. With that same fighting spirit that Ralph instilled into Tim he closed up and moved to the final location just 3.5 miles east of the second location where he and Alice have been surviving since 1977. They started over from scratch moving the Totem Pole Trading Post to an old two bay Shell Station right at the western edge of Rolla, MO. Tim has fought to reinvent and to improve his trading post over the last 3 decades. 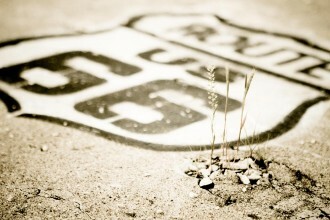 The 1970’s through the early 1980’s saw the elimination of Route 66 from our National Highway System. The economy was stagnated during the oil crisis. The way people travel would forever change. The destination became increasingly more important that the trip. Despite the hurdles thrown at the Jones family they have constantly been able to evolve; keeping their doors open and the travelers coming in. In 1994 he performed an extensive renovation that involved installing a roof over the entire structure of the trading post and the gas station canopy. Tim and Alice have been selling hand crafted goods from the Ozarks, antiques, oddities, fireworks, books and a large amount of Route 66 souvenirs. They had to stop selling gasoline about 5 years ago because they were unable to make any money on it due to credit card fees. They stopped selling gas, but set out to make a café to refuel travelers in a different way. Aim for their bellies. This year they are opening their newest creation, The Route 66 Lunchroom. With the help of James Crabtree, he and Tim created a great little lunch menu to help travelers get their fix on 66 without breaking the bank. You’ll find homemade affordable lunch fare like sandwiches, salads, chili, and even a large range of desserts. You can count on getting your favorite Route 66 soda as well. This latest endeavor didn’t come easy. Alice is still suffering from a severe car accident that happened about 5 years ago. The city health department and community development department handed Tim an extensive list of hurdles to overcome in order to operate as a food service station. Tim has also had break-ins where thieves made off with valuable merchandise. Tim and Alice still have plenty of fight in their spirits. With the help of James and a whole lot of creative resourcefulness, it looks like The Totem Pole Trading Post will be a landmark for years to come. Be sure to stop in and visit the Trading Post on your next trip down Route 66. There is something for everyone. Tim is a wealth of knowledge on local history and has plenty of great memorabilia on display.